To all the web hosting & domain name raffle winners of 1st Mindanao Bloggers Summit please drop a comment or email me. The coupons from a major sponsor – Bitstop Network Services already arrived and i’m gonna get it later from Blogie – i think that is a coupon for 5 domain names (.com/.net/.org) and 2 webhosting combo of blog and shopping cart. Another major sponsors – NokiaHost will also be giving domains and hosting and my Moro Hosting will also be giving 7 wordpress webhosting account. I will also get all the list of raffle winners from Blogie and verify the comments here. Please do get in touch with me so we could help you setup your new soon spanking blogs! 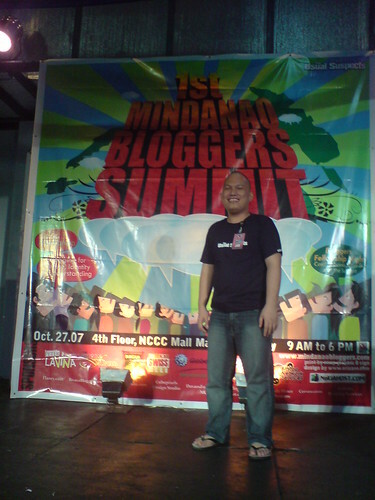 The 1st Mindanao Bloggers Summit was organized by The Usual Suspect and i’m proudly one of them. I’m so excited for tomorrows event or later this morning as i was writing this around 2:47am. I’m still awake because im finishing up my film script. Check the pictures – night before the summit, busy preparing. More pictures to be posted in my flickr account. I’ll update it after the summit. 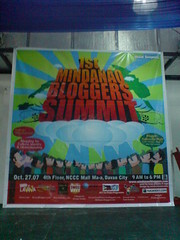 Heres the link of Mindanao Bloggers Summit Photos. And also check Jayvee’s Ingress at the Mindanao Blogger Summit. Curious about what the Tausugs of this generation? is there a Tausug Gagandilan left in this generation? Tausug is amongst the bravest specimen in the history of humanity along with the Spartans, Vietnamese and Gurkhas. The BIGGEST JOB FAIR in Mindanao aptly called “Career Gateways 2007” is happening soon. The caravan will kick off at the SM Entertainment Center in Davao City on October 17 and at the KCC Convention Hall in General Santos City on October 19. Mindanao Film is my new website and niche blogs about film, cinema and movies.